"This is one Jew you're not going to castrate, Kelno." Over the years, there have been quite a few mini-series produced for television, some good, many not so great. In recent years, productions of The Odyssey, Stephen King's The Shining, and The 10th Kingdom have earned big ratings and big bucks in advertising dollars for their respective networks, and they all owe a debt of gratitude to one series: QB VII, the program that birthed the mini-series genre. 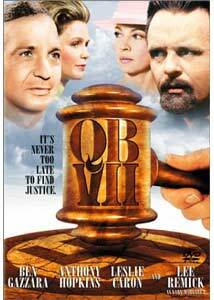 Originally aired in 1974, QB VII (or the Queen's Bench 7, a reference to the British judicial system) follows a court battle between journalist Abe Cady (Gazarra) and Polish-born doctor Adam Kelno (Hopkins). In his book about the concentration camps in Nazi Germany during WWII, Cady made statements indicating Kelno was involved in atrocious experiments on prisoners in the camps. Kelno, however, vehemently denies the charges and seeks damages in court. The film was based on an actual trial heard in the British courts, and the situation is certainly ripe with dramatic moments. The storyline is fairly balanced, with ambiguity over Kelno's guilt and a questioning of his (and Cady's) motives in the case. Much happens throughout the five-hour running time: remembrances from war prisoners, shocking surprise witnesses, and touching character development. Watching five hours in a courtroom setting would've been quite boring, and director Tom Gries has done quite a lot to keep the up the pace and the drama. The most impressive aspect of the series is the acting. The cast is uniformly excellent, but of course the real standouts are leads Anthony Hopkins and Ben Gazzara. Hopkins, one of those rare actors who almost never gives a bad performance, is especially good as the conflicted Kelno. Despite a thick accent and several rather unpleasant character traits, Hopkins is able to create a realistic, well-rounded, and affecting character. Gazzara is also warrants mention, as it is his determined journalist that forms the narrative core of the film. His role isn't as showy as Hopkins', but he carries it well nonetheless. It's funny that I feel compelled, in reviewing this film, to comment on the direction as a bit too clichéd or "movie-of-the-week" for my taste. After all, if this film was the first of its kind, than how could it be clichéd? And overall, despite some heavy-handed sermonizing and a rather flat ending, QB VII is engrossing for the majority of its running time, and interesting piece of television history with a compelling plot and several fine performances. Image Transfer Review: QB VII was made in the 1970s, and frankly, it looks its age. The image on this disc is not terrible by any means, but it certainly shows a bit of wear and quite a lot of film grain. The black level is noticeably a bit weak, with many dim scenes looking a bit murky (and even more grainy that the rest of the film). Colors in general look a bit muted and washed out. Other than that, however, fine detail is very good, and I noticed no instances of artifacting or edge-enhancement. Audio Transfer Review: This disc includes the original broadcast mono track, and it suits the film well. After all, a courtroom drama doesn't require a flashy sound mix! The center channel carries everything, and for the most part, the music and dialogue have been well mixed, with the speech always sounding clear and understandable. Unfortunately, it (along with the music) also sounds a bit flat and unsupported, with several obvious instances of ADR. Extras Review: QB VII is a two-disc set due to length, not supplemental content. The extras are housed on disc two, and amount to some brief talent files and trailers for East/West, The Odessa File, The Guns of Navarone and Fail-Safe. Some production notes are also included in a fold out booklet. Though it started the genre and is nearly 30 years old, QB VII still stands up remarkably well to later entries in the mini-series field. It's worth seeing for the performances alone, but the storyline is certainly absorbing as well. Though it's a bit light in the supplemental department, Columbia-TriStar has provided the series with a very nice DVD edition.